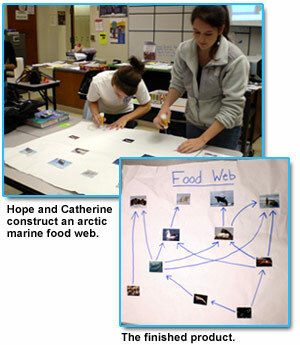 Students in Little Rock, Arkansas, explore Arctic Marine Ecology with the help of ACES. Little Rock Central High School is an urban public high school that caters to a very diverse student body of approximately 2500 students in grades 9-12. Although far from the ocean, interested students at LRCHS were able to learn about marine ecology by utilizing the lessons and data available through the ACES curriculum. During the week-long after school program, students were introduced to arctic marine ecology and current issues associated with the arctic ecosystems. As a part of their studies, students learned about polar bears and tracked their movements using data from the ACES websites. Students applied what they learned to identify possible locations for a new National Marine Sanctuary to protect polar bear habitats. 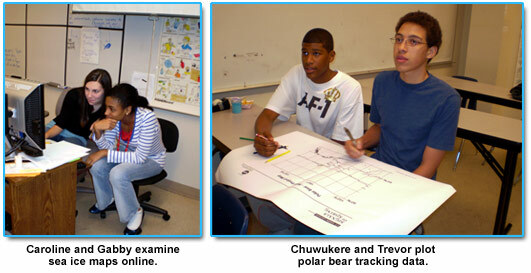 Biology teacher Mary Katherine Parson had this to say about the enrichment program, "Incorporating technology and current tracking data on polar bears was a great way to hook the students into their studies of arctic ecology. The maps and data were easy for the student to navigate and showed them that there are still many questions in biology left to be answered. They enjoyed feeling like they were making decisions real scientists make when deciding where to designate protected habitats." Little Rock Central High School will begin a new course in Marine Biology and Oceanography in the 2009-2010 school year. The ACES: Signals of Spring curriculum will be the foundation for the course.